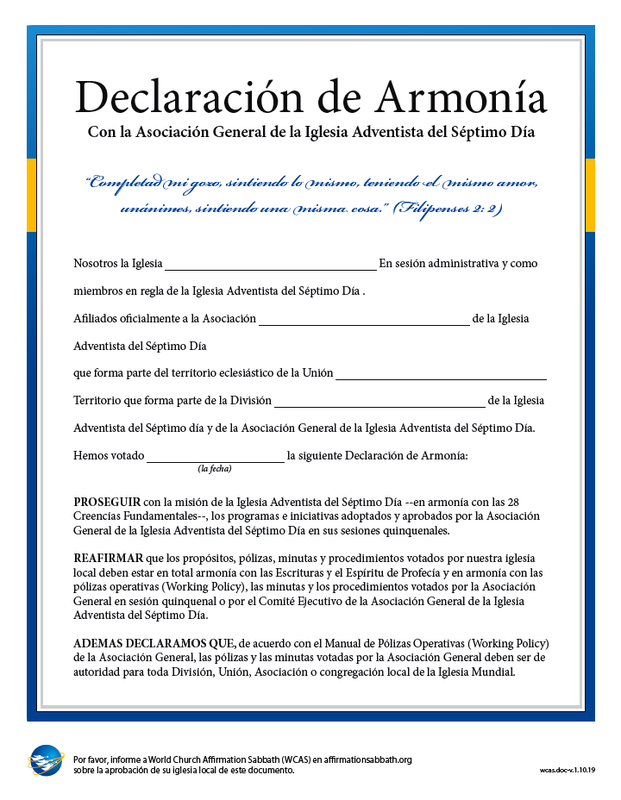 A Spanish-speaking church wishes to show support for the worldwide Seventh-day Adventist Church and its voted actions by discussing the WCAS Statement of Harmony. This harmony statement has already been shared with our English-speaking friends and here is the Spanish translation. God provided Spanish translators to help us with this project. “So long as all created beings acknowledged the allegiance of love, there was perfect harmony throughout the universe of God. It was the joy of the heavenly host to fulfill the purpose of their Creator. They delighted in reflecting His glory and showing forth His praise. And while love to God was supreme, love for one another was confiding and unselfish. There was no note of discord to mar the celestial harmonies,” (PP 35, emphasis supplied). Enter Lucifer, with his desire for self-exaltation. “Now the perfect harmony of heaven was broken,” (Ibid, emphasis supplied). The first chapter of Patriarchs and Prophets details this story; in many details it matches the current compliance struggle within God's remnant church. Read it to see how God handles rebellion. “The great controversy is ended. Sin and sinners are no more. The entire universe is clean. One pulse of harmony and gladness beats through the vast creation,” (GC 678, emphasis supplied). Please continue to pray for WCAS and for faithful, loyal Seventh-day Adventists as this message echoes around the world. Please pray especially fervently for those in sensitive areas who support this WCAS Statement of Harmony but choose to list their churches without names, due to tensions within their conferences. Our special thanks to Elder Daniel Scarone of Michigan Conference for this Spanish translation. “For this is the will of God, that by doing good you may put to silence the ignorance of foolish men— as free, yet not using liberty as a cloak for vice, but as bondservants of God. Honor all people. Love the brotherhood. Fear God. Honor the king” (1 Peter 2:15). Harmony is a beautiful sound, in any language!